Scientists have announced a collaboration to develop an affordable photovoltaic system capable of concentrating, on average, the power of 2,000 suns, with an efficiency that can collect 80 percent of the incoming radiation and convert it to useful energy. 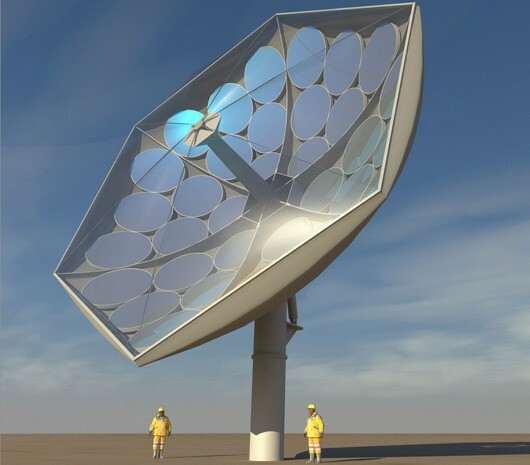 The proposed system can be built anywhere sustainable energy, drinkable water and cool air are in short supply at a cost of three times lower than comparable systems. Based on a study by the European Solar Thermal Electricity Association and Greenpeace International it would take only two percent of the Sahara Desert's land area to supply the world's electricity needs. Unfortunately, current solar technologies on the market today are too expensive and slow to produce, require rare Earth minerals and lack the efﬁciency to make such massive installations practical. In the HCPVT system, instead of heating a building, the 90 degree Celsius water will pass through a porous membrane distillation system where it is then vaporized and desalinated. Such a system could provide 30-40 liters of drinkable water per square meter of receiver area per day, while still generating electricity with a more than 25 percent yield or two kilowatts hours per day. That is a little less than half the amount of water the average person needs per day according to the United Nations, but a large installation could provide enough water for a small town.